The TARP continues to grab headlines, so I thought it would be useful to summarize how the TARP money has been used to date. » Three firms — AIG, Bank of America, and Citigroup — account for the majority of TARP investments in the financial sector. Those three firms have received $165 billion thus far, more than the $149 billion received by all other financial firms. » The comparison is even starker if we consider repayment. 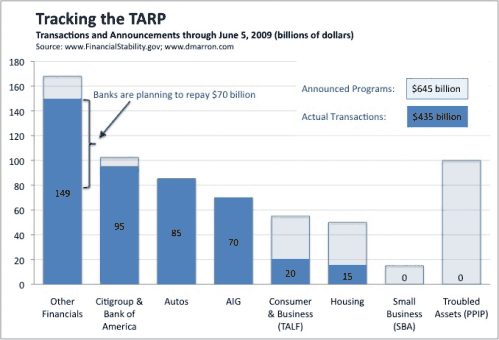 Banks are planning to repay about $70 billion in TARP investments (a bit less than $2 billion has already happened, with another $68 billion under consideration by banks that “passed” the stress test). If that happens, then the outstanding TARP investment to the rest of the financial sector will fall to $79 billion, only slightly more than what AIG has received by itself. » The auto industry has been the other major TARP recipient, with transactions now totaling about $85 billion. These amounts have primarily gone to Chrysler and GM (both the pre- and post-bankruptcy versions), but the auto suppliers and GMAC have also been recipients. » As yet, the other TARP programs have received relatively little money from TARP. Efforts to support consumer and business lending through the Term Asset-Backed Securities Lending Facility (TALF) have received $20 billion of TARP money thus far, and $15 billion has been allocated for efforts to encourage modifications to home mortgages. » The other two programs have yet to get off the ground. One program — purchasing loans backed by the Small Business Administration (SBA) appears to be in progress, while the Public-Private Investment Partnership to purchase troubled assets has experienced some well-known difficulties. Disclosure: I have no investments in any TARP recipients. A Note on Data and Sources: The official web site for TARP has a wealth of information, including TARP transaction reports, testimonies, contract terms, etc. The New York Times also has a page tracking the program: “Tracking the $700 Billion Bailout” as does ProPublica. You will find small differences in numbers between these sources, depending on when they were last updated and how they categorize certain TARP programs (e.g., $25 billion of the intended PPIP would be routed through the TALF). There are also subtleties about the difference between money that Treasury has actually spent vs. guarantees that it has provided. For example, Citigroup has received $45 billion in cash and has received a guarantee worth up to $5 billion. So I report Citigroup as receiving $50 billion.